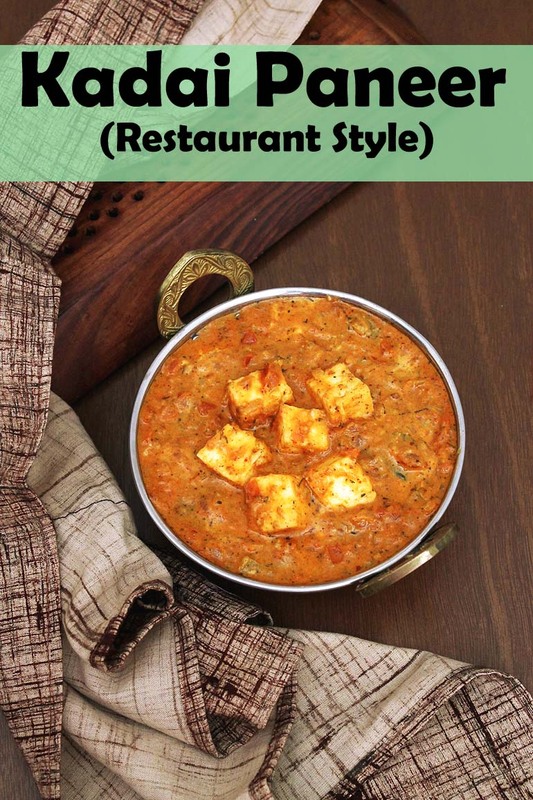 This kadai paneer recipe is a restaurant style gravy recipe. 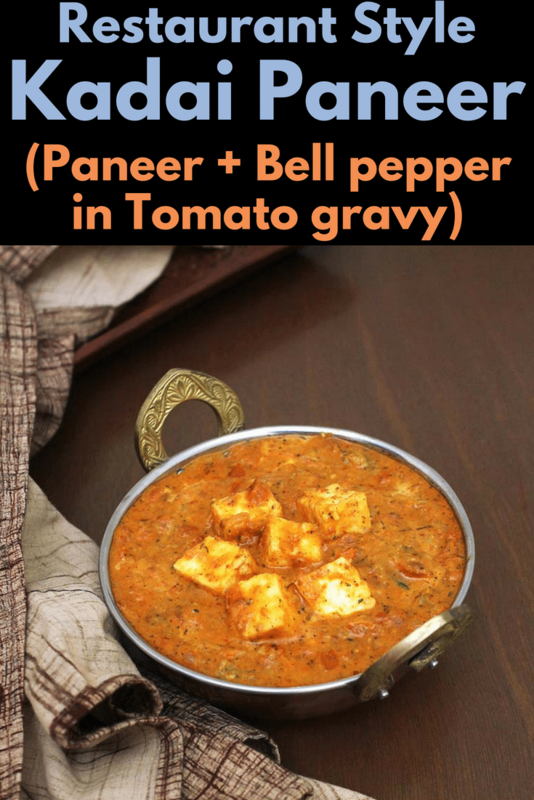 It is spicy, delicious and very easy to make paneer dish. So let’s translate the dish name. Kadai means Indian wok. This Indian wok is little similar to Chinese wok. The difference is Chinese wok has more depth. And Paneer means Indian cottage cheese. So basically, a paneer dish made in kadai called kadai paneer. The gravy is made from onions and lots of tomatoes. Yes, tomatoes are the reason for this gravy’s bright red color. To make it more flavorful, let’s make the kadai masala powder at home. What is in Kadai Masala? Kadai masala is made from coriander seeds and dried red chilies. Occasionally peppercorns, cinnamon stick, cloves, cumin seeds and fennel seeds are also added. These whole spices are dry roasted till fragrant and then ground into powder. When we make fresh kadai masala powder at home, it makes huge difference in the kadai paneer gravy’s flavor and taste. Here dried red chilies makes the dish spicy. If you prefer less spicy version then use kashmiri red chilies which gives vibrant red color but makes it less spicy. Other than using in kadai paneer recipe, this kadai masala can be used in kadai vegetables, kadai bhindi or kadai mushroom. If making these recipes on regular basis then make the masala powder in big batch and store in airtight container. It stays good, fresh for 4-6 months. Kadai paneer gravy: as the name says, it has gravy. I am sharing this gravy version today. The texture of the gravy is not smooth like shahi paneer or palak paneer or paneer butter masala. It is slightly chunky because of the chopped tomatoes in it. Dry kadai paneer (Sabi kind): To make dry kadai paneer recipe, just follow the same below method minus the water. So when you skip the water, there will be semi-dry gravy. And it will be coated to the paneer pieces. It’s all about the preferences. Choose as per your family members liking. Paneer: Always use the fresh paneer. You can use homemade paneer (by the way it is very easy to make!!). Or use the store bought paneer. In USA, you can find in any Indian grocery stores (in freezer section). I have seen some Costco does carry frozen paneer (Gopi brand). But I prefer the nanak brand from Indian grocery stores. Tomatoes: used two different ways. Once is finely chopped tomatoes which makes the gravy chunky. Second is very little pureed tomatoes which adds some thickness to the gravy. Because we are using good amount of tomatoes, I highly recommend using ripe, red tomatoes. Bell pepper (capsicum): It adds the texture and crunch to the dish. I cooked capsicum till 80% done. Because I like crunchy bell pepper. You can cook them all the way through. How to make Vegan Kadai Paneer? Instead of paneer, use firm tofu. Instead of heavy whipping cream, use 4 tablespoons of cashew paste (8-10 cashew nuts soaked in warm water and then ground into paste) OR use coconut cream (it gives slight different taste). Remove the stems and seeds of the dried red chilies. It reduces the spiciness and also the heat from seeds is not good for your body. For less spicy taste, please use kashmiri red chilies. There is no need to add additional red chili powder, as dried red chilies are enough to make it spicy. If you like more spicy than you can add some chili powder. Always use ripe tomatoes. If using slightly unripe tomatoes then the gravy will be sour. Once chopped tomatoes get cooked and soft, mash them with back of spatula. It makes thick gravy. Otherwise the water and tomatoes stay separated. To avoid that also simmer for good 5 minutes after adding water and capsicum. When the curry is served in the plate, water is separating from gravy and running in the plate. I hate it when this happens. 1) Dry roast the coriander seeds and dried chilies on medium heat. Keep stirring constantly. As it toasted you will get nice aroma of coriander seeds. also chilies will get darker in color. Remove it to a plate or bowl and let it cool completely. 2) Once cooled, grind into a powder using spice grinder or coffee grinder. 3) In the same pan heat the oil on medium heat. Once hot add chopped onions. Sprinkle some salt to speed up the process. 4) Cook them till it gets translucent. 5) Add garlic paste. Alternately you use freshly grated garlic. 6) Mix and cook for 35-40 seconds. or till the raw smell goes away. 7) Add ground spice powder. 8) Stir and saute for a minute. 9) Add chopped tomatoes and remaining salt. 10) Mix well and let it cook. 11) It will start to leave its water and will get soften. Keep mashing the soften tomatoes with back of the spatula. 12) As it cooks, all the moisture will evaporates. it starts to leave the sides of the pan. 13) Then add pureed tomato. 14) Mix it well. Instead you can use 2 tablespoons of store bought tomato puree for brighter color. 15) stir in garam masala and kasoori methi. 16) Cook till again it leave the sides. And oil should ooze out. 17) Add 1 cup of water or as required to make gravy consistency. Add capsicums. Cook for 4-5 minutes, so it gets cooked. 18) Add paneer. stir gently so paneer cubes does not break. 20) Stir well and let comes a boil. Then turn of the gas heat. If you like sprinkle some chopped cilantro. 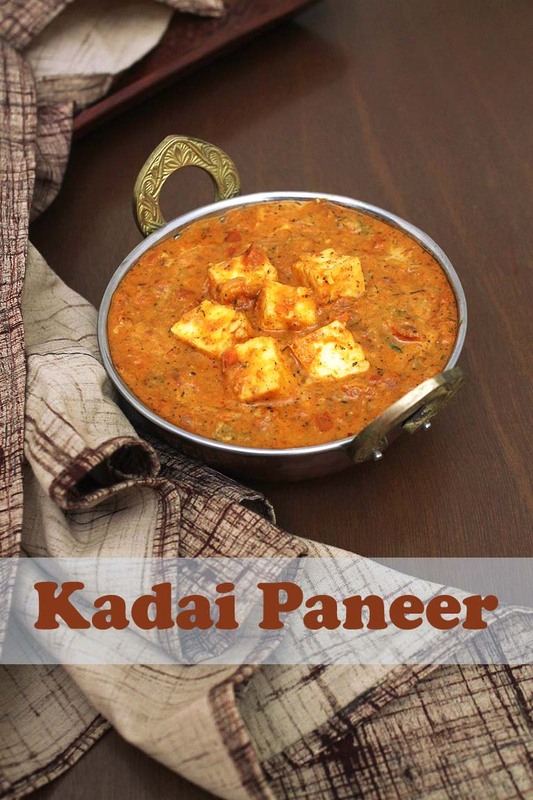 Serving suggestion: Serve this kadai paneer gravy with paratha, naan or kulcha. Also have some kachumber salad or onion lachha (sliced onions w/ drizzle of lemon juice) on side. Sometimes I do serve salted chaas or masala chaas on side. THE BEST kadai paneer made with homemade fresh kadai masala. Dry roast the coriander seeds and dried chilies on medium heat with stirring constantly. As it toasted you will get nice aroma of coriander seeds. also chillies will get darker in color. Remove it to a plate or bowl and let it cool completely. Then grind into a powder using spice grinder or coffee grinder. Heat the oil in a pan on medium heat. Once hot add onions and sprinkle little salt, cook till onions get soft and translucent. Then mix in garlic paste and cook for 30 seconds or till the raw smell of garlic goes away. Now add prepared kadai masala and cook for a minute. Mix in chopped tomatoes and remaining salt, cook till they get soft and mushy, Do mash them using back of spatula as it gets soft. Now add pureed tomato and cook for 2-3 minutes. Mix in garam masala and kasuri methi along with 1 cup of water to get gravy consistency and bring it to a simmer. Add capsicums and cook for 4-5 minutes, so it gets cooked. Add paneer and mix gently and simmer for 2 minutes. lastly mix in cream and cook for a minute. Then turn off the stove. Hi, Kanan recipe is very easy and delicious. in the recipe card, I have mentioned the serving size. You can click up and down button to change the serving size. Sorry, Somehow auto correct has made Kanan to Kajal and I haven’t noticed, I can update the name, Thank you for all recipes. Glad to know that you liked my recipes. Awesome recipe..very easy to make & tastes yum.